101 p. : ill. ; 28 cm. 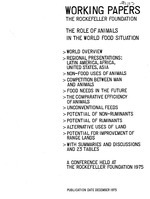 The Role of animals in the world food situation. 1. Food supply--Congresses. 2. Animal industry-Congresses. 3. Animal food--Congresses. I. Series: Rockefeller Foundation. Working papers The Rockefeller Foundation. Bart P. Cardon Chairman and Chief Executive Officer Arizona Feeds, Inc. The following are papers presented or consulted at the conference. They may be obtained by writing to the author at the address listed below. "Cellulosic Crop Residues and By-products"
"Overview of Livestock Industry in Latin America"
Unless unforeseen forces cause a change in current trends, the amount of food required by the world's people within the next twenty years will be more than do-able that currently produced -- and could double again in each succeeding twentyfive years or less thereafter. Such a requirement will tax the world food producing capacity under any circumstances; it also will place great pressures on agriculture to produce without adversely affecting the environment. That means that the land currently in use must be made to yield more, that new production technologies must be developed and put to use, that new land areas must be brought into productive use (perhaps at great cost), and that all resources must be used more wisely, more effectively, more efficiently in the sustained production of food. What people eat depends of course on a number of factors determined by custom, a comparison of cost, taste, and availability. There may or may not be any direct relationship between cost and nutritional value. However, as incomes rise, people generally will move up the nutritional ladder, substituting first cereals for starches, and then fats and animal products for cereals. The abundance and price of one food commodity, such as cereals, will influence the "offerings" and prices of other commodities, such as meats. That the supply and demand of different food commodities axe influenced by economic considerations is often overlooked when food emergencies occur. In the wake of the recent world food crisis, the use of grains to feed animals has come under public scrutiny. Whether grains are fed to animals (as I'feed" grains) or fed to people (as "food" grains), the truth of the matter is that most gTains can be readily fed to both. On the other hand, animals, which provide man with much nutrition as well as draft power, hides, fertilizer, and many other useful products, consume many other things besides grain. Most of these "other things" have no direct value to man. Economic considerations generally determine what proportion of animal feed is grains as compared to "other things." of the poor, of basic food requirements) and those of supply. How animals, and more particularly the feeding of animals, fit into that balance was the primary purpose of calling together a selected group of knowledgeable individuals not to provide all the answers but to set forth those issues which must be examined with continuing refinement and to determine our current state of knowledge about those issues. The emphasis fell on ruminant animals, in large part because they offer that greater flexibility in the use of feed resources which places them at the center of controversy. The basic questions asked were: What are the resources? Where are they? How can they be best used to feed the world in which some semblance of choice remains? 1. 400 to 500 million people in the world now suffer an absolute shortage of calories or malnutrition. There has been :little or no improvement in this apalling figure in recent years and, due to the historically unprecedented rate of population increase, it will be increasingly more difficult to improve the state of nutrition in the future. human beings and livestock for food. Farm animals, particularly ruminants, have a unique ability to convert feeds other than cereals and oilseeds into protein for human consumption; generally these animals either graze or eat waste products. Grains and other high quality feeds are fed primarily to supplement the usual rations in order to strengthen animals for heavy productive work or to produce products in which the grain-to-product ratio is relatively low, i.e., milk or poultry. Consequently, animals in developing countries are smaller, grow slower, mature later, and produce less than their western counterparts. Yet they are reasonably efficient considering the land, labor, and nutrients available to them. business principles. It depends on the cost and availability y of feed ingredients both of which have been highly favorable in the U.S. until recently. millions of pQeo-ple in the developing world. The high productivity of U.S. farmers and the existence of enormous quantities of surplus grain in the U.S. made possible a livestock production system based on grain feeding and still providing relatively inexpensive meat to the American consumer. However, it is not automatic that grain t1releasedfl from feeding animals will be exported abroad. Grain will be fed to livestock when it is economic to do so. From time to time, in the future as in the past, we can expect shifts in grain feeding to beef cattle and certainly changes in price relationships. 5. There are significant differences among types of livestock regarding relative efficiency in converting grains. While the measurement of efficiency is complicated, generally it can be concluded that dairy enterprises achieve the most efficient levels of protein production (growing more efficient as the proportion of grain rises), followed by the production of broilers and eggs in the U.S., then pork, and lastly beef. However, the future of ruminants, including beef cattle, is assured because they can digest the cellulose in grass and other forages, which man cannot use directly. Taking into consideration all factors, the pig, not the cow, is in the most precarious position of all farm animals in the U.S. from the standpoint of efficiency. 6. There is substantial scope for improving animal production in both developing and developed countries. Range management has yet received only limited attention. Pastures can be upgraded. Many of the animal diseases are not adequately controlled. Effective methods of treatment have been developed to break down the woody fibers in the cell walls of crop residues to increase digestibility. An odorless, sanitary, nutritious feed has been developed from animal manure. throughout the world. Funding for research is now very low, services to treat animal diseases are generally inadequate, marketing systems are often poorly coordinated, and prices received by farmers fluctuate widely. In each area, gove rnm ent action could make significant contributions. 8. Mach remains to be done in seeking alternatives to current feeding practices. Under present conditions in which world markets will be bidding for U.S. grains, some shifts in meat production and consumption patterns are likely and probably desirable. We hope that this report will be the beginning of a continuing intelligent dialogue on the topic of the role of animals in the future world food supply. December, 1975 Ralph W. Cummings, Jr.
Dr. Schertz, the first speaker, presented an overview of the world's food resources by means of a series of tables (see appendix). In 1959-61, he pointed out, about half the world's protein supply oame from cereals. Less than one-seventh of the protein in the diet-deficient countries came from animals, but in the developed countries the proportion was almost one-half (table 1). Dr. Sohertz showed that the use of cereals for livestock feed in the dietadequate countries almost equaled the consumption by humans in the diet-deficient lands. The Green Revolution, he asserted, has been largely a phenomenon of the richer countries. To be sure, total grain production rose proportionally more in the less-developed countries than in the developed nations between 1948-52 and 1966-70. But average grain yields per hectare rose sharply in the latter, especially in the United States, and only slightly in the former. Most of the production gains in the less-developed countries came from a sizable expansion of the areas devoted to grainproduction (table 2). Next, Dr. Schertz discussed changes in world consumption of cereals as food and as feed. He pointed out the "very dramatic increase" in the use of grain as feed in the USSR between 1966 and 1975 and "the very substantial decrease here in the United States as price ratios justified and encouraged producers to change their feeding of grain" (table 3). it became apparent that the centrally planned countries fell below both the developed and the developing worlds in beef and buffalo, but exceeded both in pork, thanks to the large number of swine in China. The curves for poultry meat production were similar to those for total meat. When numbers and production of cattle and buffalo are charted as percentages of the world, Dr. Schertz demonstrated, two phenomena become apparent (table 5). One is that the rich countries have a disproportionate share of the animal food. "The other thing you'll notice here is the relatively large numbers of livestock in low-income countries," he continued. "Developed countries have 21 percent of the cattle numbers, but they produce about 50 percent of the beef, about 50 percent of the milk, and about 40 percent of the hides. Looking at the developing countries one sees a very large percentage of the animal numbers, 60 percent, but production as being quite low in terms of animal units." Data for swine, sheep, and goats show similar profiles, but data for chickens are not as disproportionate--because, Schertz suggested, of a better transfer of technology. The consumption of meat reflects the seame trends. Consumption is comparatively high in the developed countries, except for Japan, and low in the rest of the world, including the Soviet Union. Finally, tables on the world meat trade in 1973 showed the developed world as a net exporter and both the developing and the centrally planned nations as net importers (table 6). worldwide basis the consumption of grain as animal feed was low and that the productivity as food of the great numbers of animals in the low-income countries was also very low. He emphasized, however, that this calculation made no allowance for the use of animals for power or other functions. An "added complexity" to keep in mind, he continued, was the dynamics of supply response. If everyone in the United States decided to live on cereals and to eat no meat, he said, the subsequent drop in demand for cereals as animal feed would result in lower prices, and in response the supply would fall. But if no other factor produced higher incomes for people in India and Bangladesh their consumption of cereals would not significantly improve. On the other hand, if livestock consumption in the United States rose, say, 20 percent, grain production would probably increase without much rise in prices. The people of Bangladesh and India again would see little effect. greater consumption of grain. "And I think somehow or another," he added, "we've got to be able to differentiate between animal grains and people grains." Dr. Schertz argued, however, that it was difficult to calculate what proportion of the grain fed to animals was actually usable by humans. Some people regard maize, for example, as food, and others do not. Indians eat millets, which we would classify as coarse grains. Then too, land that is used to grow one type of grain can sometimes be used to produce others. Moreover, people's preferences can change with changing conditions. Bangladesh, for instance, which once requested rice as food aid from the United States, was given wheat instead and developed a preference for it. A similar result followed a shipment of sorghum to India in the 1960s. For these reasons, he said, he had not attempted to estimate the amounts of feed usable as food. Dr. Pino supported this point and also wondered whether r sped of weight gain was necessarily the most useful measure of efficiency in animal production. Dr. Johnston, just before beginning his formal presentation on livestock in Asia, said one factor that explained much of the difference in productivity between Asia and the West was the proportion of reproducing cows. "I~n most Western countries they are at least 50 percent of the total population. In Asia they are frequently less than 10 percent, because animals are retained for draft -use rather than reproduction and meat. There are many things that determine productivity." Three speakers each dealt with one of the broad regions of the developing world Asia, Latin America, and Africa. Sharp differences were apparent in the way animals are raised, used, and regarded. In Asia, animals by and large are part of subsistence-level systems in which they consume very little that the farm family might otherwise use. The use of water buffaloes and cattle as draft animals, moreover, is highly important over much of the continent. meat and milk on pasture-based systems and on farms of all sizes from tiny plots to enormous ranches. And in Africa, where most of the cattle are raised in nomadic systems, large areas of the continent are barred to them because of the prevalence of trypanosomiasis and other diseases. An even greater contrast exists between these various systems and the United States practice of finishing beef cattle in feedlots on high-grain concentrates. Describing the traditional Asian systems, Dr. Johnston pointed out that they had developed over thousands of years. They are basically subsistence systems, he said, to which the animals contribute labor, manure for fertilizer and fuel, and food--milk, eggs, and meat. But animals seldom consume food that would normally be needed by the human population. Urbanization and the shrinking size of land holdings are now eroding these systems, and intensive production on the Western model is appearing, as well as other systems that employ an intermediate technology. Nevertheless, traditional ways remain dominant. By Western standards these systems seem inefficient, Dr. Johnston said. The animals are smaller, crow slower, mature later, andoduce less than their Western counterparts. Yet they are reasonably efficient considering the land labor, and nutrients available to them, and their performance could improve with additional inputs. use ~Dssible for such areas. The total in Asia is about 125 million, almost all the world's buffaloes. Although cattle are smaller than buffaloes, they can work longer hours during hot weather and can be used in upland areas where water for wallowing is not available. Most native breeds produce less milk than the riverine buffalo. Cattle are not slaughtered in India, for religious reasons, but elsewhere they are a valuable source of meat. Little cross-breeding to Western types has been done. The feeding and management of cattle are similar to those for the water buffalo. The number of cattle in Asia is more than 350 million. The Muslims, who are preponderant in Western Asia, do not eat pork, but the pig is the most important meat animal (except for fish) in China and in areas influenced by Chinese culture. The continent numbers perhaps 280 million swine, and more than 80 percent of them are in China. Although the pig's digestive system is more like the human's than it is the ruminant's, it does not compete for the human food supply under traditional feeding and management. Almost anything of nutritive value can go into its feed, including banana stems, water weeds rice bran, and table scraps, and this feed is usually cooked. The growth of swine is slow but requires little or no cash outlay. In Thailand, as an example, a typical farmer raises and sells one or two pigs a year, and the sale is his principal source of cash. More intensive production units have been established to consume the rice byproducts of mills, distilleries, noodle factories, and the like, and to supply pork to urban areas. These units supplement the feed with vitamins, minerals, and antibiotics but little else. Another system found in Southeast Asia associates piggeries with fish-stocked ponds. Water plants in the ponds are fertilized by the pigs' wastes and are consumed by both the fish and the pigs. The fish are harvested by periodically draining the ponds. In recent years many modern pig-producing units have been established near the cities. Their standards of management, sanitation, feed efficiency, and pork quality compare favorably with those in Western countries. Some farmers use commercially formulated rations, but most buy only premixes and prepare their own rations, varying the composition according to prices. In response to lower -relative prices, the demand for poultry products has expanded more rapidly than any other form of animal output during the last two decades. A consumer preference for live native birds is yielding in the cities before the price advantage of fully dressed hybrid broilers, and egg consumption is gaining even more rapidly. The modern high-production units depend on commercial mixed feeds. Despite this trend, native fowl remain quite important on farms and in villages. There they make an important contribution to the nutrition of rural families at practically no cost. Southeast Asia. Meat production tends to be seasonal, with large numbers of ducklings hatched toward the end of the rice-growing season to glean the paddies after harvest. Thus they make use of a resource that otherwise would be wasted. Some large flocks are maintained in confinement and fed on trash fish and rice byproducts, but in general ducks canot Compete with chickens in feed efficiency under intensive conditions. Dr. Johnston estimated that the potential for increasing the production of animal food products in Asia was considerable (tables 8, 9). But any such increase, he said, must not come at the expense of food grains (table 10). "The truth is that Asia needs all of its food grains for human consumption. Diversion of either cereals or land on which cereals can be gown to use in animal prodction would be, hard tojuslj ." He calculated, however, that the present supplies of bran, oil seeds, and other crop by-products could sustain larger numbers of cattle and buffaloes than they now do. As crop production increases through the spread of multiple cropping and other developments, by-products will represent a growing resource that will be usable only by feeding animals. Referring to table 11, Dr. Raun pointed out that the numbers of livestock in Latin America in 1972 were very large, totaling around 250 million head. Beef production was about 7 million metric tons, or 27 kilograms per head. By contrast, the number in the United States was 117 million and production per animal was 87 kg. Thus the productivity per beef animal in the U.S. was more than three times that in Latin America. In milk, pork, sheep, and goats, the contrast in productivity was even more marked, amounting to a fivefold difference. With one exception, he said, the greatest numbers of livestock are concentrated in four countries--Mexico, Colombia, Brazil, and Argentina. The exception is Peru, which has more swine, sheep, and goats than Colombia, as well as an extensive population of llamas and alpacas. America from different sources. The crude protein from animals was about 2.7 million metric tons and from plants was 7.7 million tons. The animal products' share of the total was 26 percent. 'When digestible protein retained is considered, however, the proportion from animal products rises to 37 percent. Moreover, it seems likely that practically all the animal protein is consumed by humans while considerable quantities of the plant protein cannot be so consumed and are used as animal feed instead. in the United States (although the totals consumed here are larger). "The point is," Dr. Raun said, "that beef and milk are not just items that are consumed. They are diet staples." Data on family food budgets, he continued, reinforce this point. Argentina, Brazil, Colombia, and Chile are countries with distinct economic and social Patterns, yet in each the percentage of the food budgets spent on beef falls in a narrow range of between 23 and 25 percent. In terms of total family expenditures, the percentage devoted to beef ranges from 9.1 to 15. The income elasticity of demand for beef with respect to income was less than 1 in high-income groups but more than 1 in low-income groups, again indicating that beef is a basic food commodity rather than a luxury food item. Dr. Raun pointed out that of all the beef produced in Colombia, 125,000 metric tons, or 23 percent, came from dairy cattle. Conversely, of the milk entering commercial channels, 925,000 tons, or 46 percent, came from beef cattle. This pattern appears in most Latin American countries. The cattle and sheep in Colombia, he said, are produced in life-cycle production systems on pasture. The amount of grain fed these animals is insignificant. Unlike Asia, Latin America's use of crop residues as feed for these ruminants is not an important consideration outside of Mexico, although the practice does offer, some potential. The picture isentirely different, however, for poultry and swine. Poultry in Colombia consume 750,000 tons of concentrates a year and 83 percent of all commercial concentrates. Pigs are fed 1)00,000 tons of concentrates, but most of this is farm-produced, consisting of root crops, grains, and other products for which there is no effective market or which are not consumed by people. Cattle axe found on 488,000 farms, and 82 percent of these farms are smaller than 50 ha. These smaller farms have 4.1 million head of cattle, 21 percent of the total in Colombia. While these data point up the large number of cattle on just a few farms, they also indicate that the cattle holdings of small farmers are far from insignificant. Dairy cattle reflect a similar pattern. (one calf every two years), slaughter age of four years, slaughter weight of males, and daily milk production per cow compared unfavorably with the corresponding data for the United States. nutrition, with livestock management and animal health as secondary constraints. Socioeconomic constraints he listed as being the availability and cost of inputs, credit, and transportation. The overview of Africa, the third major underdeveloped region of the world, was presented by Dr. Beck on the basis of a paper whose coauthor was Howard B. Sprague. Africa, said Dr. Beck, depends as much as any other region on the ruminant to harvest plant energy. But the predominant livestock system differs sharply from that of most other areas. This system is nomadism, and Dr. Beck estimated that 40 million people depend on it as a way of life. The land area of Africa, Dr. Beck said, is almost 3 billion hectares, three times that of the United States. Of this, only 7 percent is considered arable. Another 25 percent is classified as permanent grassland; but this figure understates the land available for grazing by perhaps 100 percent because it omits the semiarid areas and the communal grazing grounds around villages. The land must support a population 64 percent larger than that of the U.S., and growing three times as fast. Dr. Beck reported. Small stock such as goats total perhaps 226 million; translated into large animal units, the overall total amounts to 213 million. Dividing this into the understated grassland figure yields an average of 2.4 hectares per animal unit. As in Asia and Latin America, the productivity of ruminants in Africa is considerably below the United States norms. Annual births are 45 percent of the cows in Africa, compared with 80 percent in the U.S. Calf losses are 35 percent, compared with 5 to 10 percent. The average age of cattle at marketing is seven years in Africa, and the market weight is half the U.S. average. The offtake of herds is only 10 percent a year. A given gain takes two to three times as much feed as it does in the.U.S., although Africa's feeding is almost entirely on forage. "It is unrealistic," Dr. Beck said, "to expect that Africa will soon equal the efficiency of production in the U.S., but it may be reasonable to substantially improve African performance." can get. The Fulani of West Africa, for instance, keep cattle principally because they can sell the milk, and milk is also obtained from camels, horses, goats, and sheep. The pressure for more dairyproducts is heay in theswelling urban areas. But production depends on the range animal, which is not bred specifically for this purpose, and European dairy breeds suffer from climate tolerance. Commercial dairy ing of the Western type is possible, however, in the highlands. Efforts to concentrate dairy herds in feedlots have also been generally successful in West Africa, but this requires management skills that are not widely available. The numbers of nonruminants are relatively low, with populations of fewer than 6 million pigs and 400 million poultry, partly because no demand for pork exists in the Muslim areas. Most of the pigs that are raised, however, are held in large commercial operations. On the other hand, most African families keep bush fowl, and thus the reported number of poultry is probably too low. Dr. Beck suggested that the prospects for growth in these numbers is limited because of the high cost and limited availability of feedstuffs, especially protein. Lack of transportation is one of the most severe limitations on animal production, Dr. Beck pointed out. The Sahelian and Sudanian zones of the interior are major production areas, but markets are largely on the coast. Lack of transport forces cattle to be driven, often across tsetse fly zones, and they reach market in very poor condition. Another major constraint is disease, particularly trypanosomiasis--the disease carried by the tsetse fly--and the tick-borne East Coast fever. These and other diseases are prevalent over wide areas of the continent between the Sudanian zone and South Africa, rendering animal production practically impossible. But the major problem is the overgrazing of range lands, Dr. Beck asserted. "Grass and water," he explained, "are considered free resources, available to the stock that gets there first." He believed that the future of the ruminant in Africa depends greatly on the improved utilization of the range. At a terrible cost, the recent drought in the Sahel performed the necessary task of reducing the number of cattle. complementarity is important and apparently offers substantial opportunity to improve the effioienoy and dependability of production to both types of producers." New, international research centers in Africa are tackling the problems of improving range land, of introducing mixed, permanent farming systems, and of oontrolling animal diseases. Long-term breeding projects to upgrade indigenous livestock are also necessary. Yet muoh can be done with existing technology. The effects of droughts could be greatly reduced, for instance, and improved animal husbandry and marketing systems offer much potential. Dr. Beck called for "numerous practical demonstrations of integrated systems suited to local conditions" both to prove their economic advantages and to demonstrate that the local people can operate them. Dr. John J. McKelvey, Jr., also noted that programs to control trypanosomiasis must not only deal with the tsetse fly but must also provide for "careful and foresighted' use of the land that provides the fly's habitat. Dr. Wheeler said the fly imposed a kind of rotational grazing system on the herdsmen that actually helped to avoid overgrazing. Dr. McKelvey said that people working for African development were interested in improving nomadism, particularly in the Sahel, rather than drastically changing it. At another point, Dr. Pino said he wondered whether the multiple-grazing concept didn't deserve emphasis. A variety of species, he explained, could use different forages in the same habitat and so make more efficient use of a given grazing area. the practice was already quite important in Africa. Dr. Martin Gonzalez added that in the Edward's plateau of Sonora, Texas, a mixture had been shown to use the land most efficiently and to yield the highest income. Dr. Butcher praised the idea but added that managing the land under such a system was more expensive, though this was not necessarily a deterrent. Dr. Byerly pointed out that management problems were more difficult in a migratory region than in one where the agriculture was sedentary and the land fenced. Mr. Cardon said a task force had been examining multiple-use concepts and was soon due to publish its report. Dr. Johnston said that in the more humid areas of the Middle East, sheep and goats were herded together because the goats browsed the brush, which otherwise would cast too much shade and inhibit the growth of the grass the sheep eat. Thus the use of goats permits the range to carry more sheep. Then too, the goat is hardier in a drought and so represents a hedge against hard times. Dr. Wheeler pointed to goats as an example of a technological base that might be receiving inadequate research, and Dr. Gonzalez cited Mexican studies of raising goats with cattle both for control of vegetation and for meat. From these surveys of the developing world the conference turned to the United States, which had already been cited often as a basis for comparison. The description presented was the familiar one of the nation as hog (and cattle) butcher of the world--and its breadbasket as well. The statistics defined impressive peaks in production per unit of land and of labor. Nevertheless the experts at the conference expressed considerable apprehension about the future of animal production here. Drastic changes for the worse were seen as overtaking the industry. The economic importance of cattle, Dr. Butcher said, is indicated by the 1972 sales figures. Cash receipts for ruminants and dairy products amounted to $25.8 billion that year, he said, which represented about $3 of every $4 received for livestock products and 42.5 percent of the receipts for all agricultural products. His source for these facts was "Ruminants as Food Producers: Now and for the Future," a study published this year by the Council for Agricultural Science and Technology (CAST) in Ames, Iowa. year-end numbers, while the offtake 50 years ago was more than 10 percentage points higher. As for per capita consumption of beef and veal, the total was 68.1 pounds in 1925 and 111.4 pounds in 1973, a rise of almost two-thirds. Beef and veal represented less than half of total meat consumption in 1925 but 63.4 percent in 1973.
farmers which at $42.80 in 1973, averaged five and a half times the 1925 figure. The increase over the same period for hogs and lambs was considerably less. The 1973 price, however, was sharply higher than the $33.50 posted the year before, and since then it has subsided. The growth of the swine industry in the United States has been less dramatic. The numbers over fifty.years rose less than 10 percent, to 61 million head, and pork production was 12,751 million pounds, up 56.9 percent. The United States population over the same period rose 81.3 percent. Hog prices rose only two and a half times, less than half the rate for beef cattle. cattle. The 50-year price increase was only 184.7 percent. Dr. Butcher said the decline in sheep in the U.S. had been attributed largely to "lack of labor, predator problems, and difficulty in marketing--an unfortunate situation." and residues or by-products from cash crops would seem to be very important in the production of high-quality human food at low dollar cost and minimum expenditure of fossil fuel," he suggested. The CAST report discusses the controversy over the role of grain as food and as feed in terms favorable to animal production. "However," Dr. Butcher said, "it seems obvious that there will be a transition for more grain to be used for human consumption and therefore less grain available for animals." Of the world's annual grain exports, the U.S. already supplies 44 percent of the wheat, 50 percent of the corn, and 89 percent of the soybeans. He wondered how much these proportions could be increased and suggested that the export of energy for human consumption might best be done in the form of fat. He sounded his gloomiest note in considering the future of the animal industry in the United States. His prepared paper asserted: "Low prices of animals and animal products versus high production cost have already caused financial disaster for many livestock enterprises, and the immediate future (one to two years) doesn't indicate much improvement. This is very serious. Will this result in a major change in means and methods of livestock production in the U.S.?" Departing from his text, he then remarked: "I don't think a lot of us recognize how serious this is. I am old enough to remember the thirties--a pretty tough time. As far as I am concerned I think that some of our problems in animal production in the United States are as serious, or possibly more serious, or will be more serious by this fall. I've had quite a bit of background in discussing this with credit agencies, and I think that can be supported." As an avenue of research, Dr. Butcher suggested the study of efficient ways to use more labor in animal agriculture as a means of increasing employment both in the U.S. and abroad. He emphasized even more strongly the need for research to minimize the cost of animal maintenance (that is, the feed necessary to prevent weight loss) through the use of forage and by-products, and to use the higherquality feeds like grain for production (that is, to put weight on animals). The importance of grain in U.S. beef production was also stressed by Mr. Cardon, one of the naio' leading feedlot operators. Feedlots feed grain, he stressed, because they make more money doing so than they would otherwise. The main reason, he asserted, is that the carcasses of grain-finished cattle receive higher grades and hence higher prices under the U.S. Department of Agriculture's grading system. directly off pasture versus fattening it first in a feedlot. For ease of oalculation he figured both animals at 1,000 pounds, although the first would not actually be grass-fat but would be a feeder of 600 to 800 pounds (table 13). At the date of his study, he said, the grain-fed animal, whioh would have been graded choice, would have been worth 40.6 oents a pound on the hoof. The pasturefed steer, however, would have been useful only for hamburger, and hence its value would have been 17.5 cents a pound less. Moreover, the grain-fed steer would have yielded a meatier carcass and would have shrunk less in processing, so its relative value after butchering would have been even more. At feed costs then current, the return to feeding would have been $44 a head. Mr. Cardon conceded that it was possible to fatten a steer to choice grade on grass, although he emphasized that the feat was rare in the United States of today. He cited a study conducted at the USDA experiment station at Beltsville, Maryland, which fed alfalfa in pellet form rather than loose to increase intake. But he showed, using the study's figures, that the cost of feeding the steers to finished weight, 997 pounds, was virtually identical for both alfalfa and grain (table 14). The feed priceshe quoted were those being paid at his feedlot, plus allowances for other costs, including pelleting the alfalfa. When the cattle were sold their grades were almost the same, and hence they received identical-prices. But since the grain-fed carcass yielded almost 45 pounds more when dressed, it offered an added return of $30.54. "And that's why we use grain," Mr. Carbon said. The grain fed to cattle, FIIr. Cardon pointed out, was not grown for human consumption. Of five leading grains raised in the United States, only wheat does not find its principal use as feed (table 15). Only 2 percent of the maize, for example, is used directly as food, and 5 percent more is used by industry, principally for whisky. marbled with fat. The more the marbling, the theory goes, the more tender it will be for steaks and roasts, and hence the better the consumer will like it. Thus the feedlot's chief job is to fatten steers. The added fat, Mr. Cardon said, replaces water in the tissues, not protein. Grass-fed carcasses shrink more in processing than the grain-fed because they have more moisture to lose. The fat represents energy the animal has consumed in excess of its maintenance requirements. For this reason, energy, chiefly grain, represents 80 to 90 percent of the cost of feedlot rations, the rest being nutritional elements like vitamins and minerals. Within the beef industry as a whole, Mr. Cardon explained, feedlots occupy the second level of a funnel-shaped system leading from farm to consumer (table 16). Three thousand of them feed 70 percent of the beef grown by 2 million farmers and ranchers, whose herds average about 22 mother cows. The rest of the funnel is occupied by some 750 meat packers and 250 retail food chains. Bach layer of the industry is a different business with different technologies, and the total system is thus quite complex. Successful feedlot operation, he demonstrated, requires a sharp eye on the prices of feeders, feeds, and fattened steers. When the cost of feeders is less per pound than the cost of their gains in the feedlot, he buys them as light as possible, usually something over 300 pounds. These are fattened as much as possible, to something over 1,000 pounds. But when the feeders cost more than the gain, h e buys them as heavy as possible, usually 600 pounds or more. These are kept only long enough to maximize their quality, which requires a gain of as little as 350 pounds. The results of feeding five different lots of about 500 head. each, some acquired light and others heavy, are shown in table 17.
acquisition) to 3.9 (for a light herd). "We have the capacity," he said, "to double the grain consumption or to cut it in half, depending on what I call the economics of the moment. And it isn't an exercise in nutrition or cattle management. It's a business decision based on the economics of the industry." His company, he said, had a computer program capable of weighing the various factors and prescribing a feeding strategy every week, or if need be every day. One factor it had not changed, however, despite wide swings in prices, was the grain in the feedlot ration. If too much low-quality roughage is fed, cattle will eat barely enough to meet their maintenance requirements and will not gain efficiently. Best results come from including 45 to 50 percent grain in the ration. Cattle feeders lost money over the past year or two not because of the weather or the government, Mr. Cardon suggested, but because of bad business judgment. "I found out early in life that outside of the movies the man in the white hat doesn't always win," he said. "But I knew that God took care of cattle feeders, drunks, and similar fools--until about the middle of 1974, when all at once I realized he's so busy with the Arabs that he had no time for cattle feeders. Now, hopefully, in 1976 he'll come back and take care of us." MR. McMILLAI: The changes narrowed the good grade to what we would call a workable grade. Up to this point it's been a very wide thing, but no consistency of quality. Therefore retailers by and large have shied away from it, because they don't get that 52 weeks a year of consistent quality. . I think as a practical matter if these changes were to go into effect, there would in fact be a greater use of the good grade. And if that use is greater, then there's going to be an automatic demand created, and I think more good cattle will be merchandized as good. I think that would even mean a saving in grain consumption. ..
DR. PING: Is the consumer likely to be paying more for a lesser grade of beef? ripped off. He is afraid that the meat he is now buying as a good grade, for which he's paying a certain price, will be raised to a choice price later. HR. NoNILLAN: No, it's not true. If you will look at that chart (table 18), or consult the literature search that Carpenter of Texas A&H has done, you will find that you're sacrificing nothing in terms of eating quality in the end product. DR. NESHEIN: Well, let's not worry about eating quality. We're worried about what the consumer's going to have to pay for a given piece of meat. HR. McMILLAN: But that varies anyway. It goes up and down. HR. CAIRDON: I never yet have seen any savings that the feeder can bring about by good management which is retained by the feeder. We're in a very competitive business. We have an oversupply of animals. DR. PING: Bart, I don't think it's the feeder that the consumer's worried about. It's the market channels-MR. CARDGN: But you see, because of our competition, we're going to sell for what the consumer will pay. The consumer sets the price in the short term. DR. BUTCHER: Host chain stores buy their beef from a packer who has his own grades, and he's been using the proposed system for at least 10 years., So really we're just making this legitimate. DIR. BUTCHER: One reason is, some of those guys have been taking advantage of it. They've been selling it, for this price on their own grade rather than USDA's grade. him for the past 10 years. DR. PING: But if we're instituting new federal grades, what are the implications of what the consumer will pay and what he will get? DR. WHEELER: There's no agreement, John. You talk to Bill there, and he's labeled right away as a spokesman for the industry. And in fact, a lot of land grant universities are labeled the same way. And so I guess it's credibility. Who's going to make this credible? What institution have we got to do it? true, Bart, that the percent of choice coming out of your lot is largely a function of where you get your feeder cattle?" "Oh, the quality of the feeder cattle determines," Mr. Cardon replied. feed cost versus the price we receive. The new grading standards throw out conformation (that is, the animal's structure) as a criterion of quality, and those (rough) cattle axe going to grade higher than they currently are." Nonfood uses of domestic animals were described by Dr. Turk. The most widespread axe draft power and transport, but others were cited, including furnishing leather and wool, providing a good use for products not consumable by humans, and even horse racing. Dr. Turk cited an FAO finding of 1966: nearly 85 percent of the total draft power used in agriculture throughout the world is provided by animals. This study estimated that despite the spread of mechanical power sources such as tractors, each of the major developing regions still depended on animals for well over 90 percent of its agricultural power. Other studies estimate that more than 20 percent of the world's population depends partly or entirely on livestock for the transport of essential goods. "The yak," said Dr. Turk, "has special qualities that make it useful as a pack animal in the high elevations of Central Asia. The same is true of the llama in the high Andes of South America, the camel in the arid and semiarid areas of the Middle East and North Africa, and the bullock, donkey, mule, and horse in many other regions." These animals, he added, function effectively not only where roads are poor or nonexistent but in cities as well. ruminants, with a majority of their food derived from forages, coarse roughages, and by-products not utilizable by humans. The horse and his relatives are nonruminants, but they subsist largely on forages and coarse feeds. When cereal grains are used to feed draft animals to improve their work efficiency, the grains are often those not normally consumed by humans. The degree of direct competition between work animals and humans, therefore, is very low. Even where there may be some degree of competition, the feeding of animals for these purposes can scarcely be avoided." Sheep, goats, and other animals are recognized for their production of wol mohair, and hair. Dr. Turk noted that the development of synthetic materials had reduced man's dependen ce on wool for clothing and other uses, but he detected a recent trend back toward the use of natural wool and plant fibers. Hides of animals can be an important source of employment and trade. As an. example he cited India, which in 1972 sold leather and leather goods valued at $121 million, about 6 percent of the value of all exports. been recognized since the domestication of livestock. Ruminants excrete from 60 to 90 percent of the fertilizing elements (nitrogen, phosphorus, and potassium) they consume, and the organic matter in manure also improves the physical condition of soil. Animals are therefore highly useful in cyclical farming systems where the forage and by-products animals take in are returned to the soil that grew them. In more intensive animal-raising systems such as feedlots and poultry houses, disposal of wastes has been a major problem. As the costs of chemical fertilizers increase, however, the economic incentives will rise for transporting these wastes to croplands. Dung is also widely used for fuel, Dr. Turk continued. In fact, 8 to 12 percent of the world's population depends on this source. About 60 percent of the dung from cattle and buffaloes in India is used for fuel, the equivalent of about 40 million tons of coal a year. Other useful nonfood products from animals, he said, include insulin, hormones, and rennin. components in total farming systems should be considered as "other roles of animals."' In this sense, animals perform a service apart from what they produce by putting to some use crop by-products, roadside weeds, wastes, and the like. Similarly, they permit useful employment for grazing and forage of lands that cannot support crops because of inadequate rainfall, distance to markets, and so on, or that are periodically planted in grass and legumes in crop rotation systems and for soil conservation. Dr. Turk cited horses. Of the 8 million in the United States, practically all are used for pleasure riding of various sorts and in the sport of horse racing, which more people attend than professional football or any other sport. He also pointed out that pets, primarily cats and dogs, share the homes of millions of families in the United States and elsewhere as well. Dogs are often used in hunting, and many households value their role as watchdogs. -wealth, social status, and community influence. They are a man's legacy to his son. They can be exchanged to symbolize formal contracts of friendship and assistance. The transfer of cattle from the groom's family to the bride's is needed to validate a marriage. Herdsmen usually tend to hoard cattle in order to build a system of human bonds aimed at increasing individual security." constraints, Dr. Turk said, on efforts to develop more productive livestock enterprises. But he concluded that they must be understood and reckoned with in planning development projects. Boyce Rensberger opened the discussion of Dr. Turk's presentation by suggesting that the consumption of protein in the United States in excess of nutritional requirements be counted as a "pleasure or recreational" use of animals. After all, he explained, much of it is done by eating steaks in restaurants and the like. After a general chuckle had subsided Terry Klopfenstein pointed out that this consumption was not strictly waste. The body uses the calories in protein for energy even if it is not needed for other purposes. Dr. Abel asked whether Dr. Turk regarded ruminants as an important means of food storage in areas where crop production was possible but highly uncertain. Dr. Turk replied that he did in some cases, and Dr. Beck and Dr. McKelvey agreed that this was especially true in Africa. Dr. Byerly addressed the topic of competition between man and animals for food and habitat. He included in his discussion the overriding issue of competition for cereals, but he also examined the consumption of forage by wildlife, the feeding of pets, and the losses of food to predators and scavengers. Dr. Byerly began with data on uses of the world's land surface. Of the 13.4 billion ha. of this surface, he said, about 1.4 billion is arable, about 3.1 billion is in pasture and range, and about 4 billion is in forest and woodland. The amount of arable land could be doubled, but doing so would displace other valuable uses. As an alternative, technology can greatly increase crop production in the present area. The cereals grown on the cropland amount to 1.3 billion metric tons, he said, and about 500 million tons of this goes directly into human consumption. Livestock and poultry products provide the world's people with about 25 million metric tons of animal protein, which equals about 30 percent of the protein in cereals not directly consumed by man. As for the United States, Dr. Byerly said that a total of about 240 million ha. is capable of continuous cropping under good management, but in recent years only about half of this has been so used. The rest is in grass, trees, or cover crops, or is idle. In 1972, for example, 117,715,000 ha. were harvested, including hay and other roughage (table 19). feed. Human consumption of g-rains as food in the U.S. amounted to 20,268,000 metric tons in 1972. Excluding grain retained as seed, this use amounted to only 11.8 percent of the grain consumed domestically and 8.3 percent of the total dispositions including exports. A comparison of the feeding of different classes of livestock in 1970 and 1920 shows a dramatic decline in the feeding of horses and mules and a rise in that of nondairy cattle and poultry. Most of the increase in feeds consisted of grain and other concentrates. Dr. Byerly also found that in 1910 half the milk protein produced in the United States was fed to animals while in 1973 no more than 10 percent was. "It seems to me," he said, "that a most impressive change has taken place." Dr. Byerly refined the accounting of grains used as feed by calculating the amount of proteins in the by-products fed to animals from the milling of food grains, compared with the amounts of protein in milk, meat, and eggs. The ratios are: milk cows 1.31; laying hens .57; and other animals .31. He also pointed out that "we spare substantial amounts of ruminant feed protein by the feed use of about 300,000 metric tons of urea annually." Urea contains nitrogen, which a ruminant can use to synthesize protein. Protein from another source, soybeans, was used in animal feeds in the U.S. in 1972 in the amount of 4 million metric tons. "This amount of protein would satisfy the requirements of about 200 million people for a year," Dr. Byerly pointed out. "Genetically high-lysine corn may become an alternative source of good protein for both man and animals." Leaf proteins also hold promise, although at present nonrumninants cannot make use of them. States by giving up cereals going into ruminants, we're going to cut milk production and beef production very sharply. We won't have a surplus of four million cows to worry about." He pointed out, however, that crop residues and other wastes could substitute for some of the grain fed to livestock. with man, but in a different sense. Much forage is suitable for both wild and domestic animals. But, he said, "over all our public lands, which are a third of our whole country, gamehave been given by law and doctrine a place that allows them at least equal rights and in some cases prior rights." The ratio of livestock to biggame animal units fell from 80:1 in 1920 to 50:1 in 1970. In the same period the forest and woodland area not grazed by livestock increased by about 47 million ha., and the grazing resources shared by both wild and domestic animals decreased by about 75 million ha. Nan's land use policies thus are favoring, to a degree, the animals he hunts or preserves for esthetic or other reasons at the expense of the animals he owns. The contribution of game to the human family's dinner table is estimated at only 2.5 pounds annually per person. Other wild herbivores also consume forage; it is estimated that six jackrabbits will eat as much as one sheep (and so will one deer). A more direct competition for food, as described by Dr. Byerly, is offered by the coyote. He cited a study conducted in Utah by a group called the Four Corners Commission, which found that half of all lamb losses, amounting to 5 percent of the lamb crop, was caused by coyote predation. Addressing Dr. Butcher, a Utahan, Dr. Byerly said: "I don't know what you're going to do about it. If you're still out in Utah and prefer coyotes, I guess we'll have coyotes." Dr. Butcher rejoined: "We don't feel it's the people in Utah who prefer coyotes. We feel it's the people in some of the rest of the country." Other predations, Dr. Byerly said, were caused by the estimated 40 million rats in the United States, although he suggested that losses have been reduced greatly by the spread of ratproof grain storage bins in the countryside. Birds of various sorts also cause locally severe losses in standing grain in many parts of the world. Companion animals--cats, dogs, and others--consume substantial quantities, he said. Dogs alone are estimated to consume 2.8 million metric tons of feed in the U.S. "This would seem to me to be all right so long as the family shares its food with the dog," he added. "But I don't like it if the family has to share the dog's food. That seems to me to be going a bit far." feeding roughage and waste but no grain? Dr. Abel responded that posing a question in a simple dichotomous form could cause one to miss the main point. Where some production systems require grain, he said, the relevant issue is what the return is on the total bundle of resources invested. Another point, however, is that population and other pressures had mistakenly caused land to be planted in grains. Returning such land to pasture, or some other use, could actually make it more productive and yield a larger social benefit. But evolving the institutions to control the use of the land is quite difficult. Consideration of the development of an underdeveloped country, he warned, required one to face the extremely complex nature of crop and livestock production, and to consider what will increase the total productivity of a whole package of resources, rather than simply one of its components. resources and with the point that the merits of livestock production depend on local circumstances. He noted that most Asian farmers depend on livestock sales for a major part of their cash income and that the rising demand for consumer goods was inducing them to sell more and consume less of their own production. foster this kind of animal production or the prerequisite degree of feed grain production. Dr. Pino concluded this phase of the discussion by describing the complementary development of grain and livestock production in an area of Mexico. A poultryand-eggs industry began around 1950, and as the demand for its products grew so did the demand for sorghum as feed. As a result, a large area is now devoted to production of this grain, partly displacing maize, which was marginal in places. This happened, he said, because "it became profitable for somebody to produce it, and for somebody to buy it, and for somebody to turn it into eggs, which would then have a market." Later in the conference another discussion developed on a similar issue. It began when Dr. Beck said he believed the grain and livestock situations in the developing world should be distinguished from those in the United States. On the one hand was the need to develop forages and range lands for the ruminant with little or no feeding of grain. In this country, on the other hand, grain production is increasing faster than its consumption by humans, with markets both through international trade and through livestock. He called for a clarification of these matters. economics would largely determine how much grain would be fed to livestock. But he added that the U.S. had to put in the balance moral imperatives,, which changed from year to year. Moreover, it is obvious that less-developed countries will have livestock industries for a long time and that their productivity can be improved in various ways-while retaining their reliance on noncompetitive products. linked through the question of availability of food aid. He saw a need for a system of priorities to assess emergency needs and aid for long-term development, in contrast to the treatment of food aid as an instrument of foreign and economic policy. "I'm not sure that we understand the real implications of 'giveaway'programs," Dr. Pino replied. "We have often seen results contrary to what we were trying to do, which was and is to establish the capability of nations to feed themselves." He also called for a policy regarding storage or maintenance of a grain inventory in the U.S. "Do we store ten percent of our potential, five percent, twenty percent. Nobody knows." Agriculture Organization of the United Nations as prepared for the World Food Conference in the fall of 1974. Other recent projections, he said, such as one by the U.S. Department of Agriculture and another by a group at Iowa State University, took a similar shape, although their numbers were different. Two main elements enter such projections, Dr. Nesheim said. One is population growth, "the number of mouths to feed"; the other is the ability of this population to pay for food. The FAO study assumed that the developed world's population would increase at a rate of 0.9 percent a year but that the developing world's rate of increase would be 2.7 percent. It also posited increases in income and food demand in both the developed and developing sectors (table 20). modestly higher in the developed world but substantially higher in the developing world. Under one set of assumptions, the increase in worldwide demand for cereals is expected to be 58.3 percent by 1990. Tn the developing market economies, however, demand for most categories of food will have risen well over 100 percent. For certain animal products the increase is expected to be even more striking because as poor people's incomes rise their demand for meat tends to rise even more rapidly. Dr. Nesheim pointed out that the developing market economies are not expected to erase their disadvantage relative to the developed world. The dimensions of this gap are demonstrated by the estimate that the underdeveloped world today has 70 percent of the world's population but consumes only 20 percent of its meat. improvement in the developing world's per capita caloric intake from 2,200 in 1970 to 2,400 by 1985. The present figure gives rise to concern, he said, because it is below the minimum nutritional standard. As an average it means that malnutrition is endemic for a certain proportion of the population. The developed world's caloric demand, by contrast, was 3,150 per capita in 1970.
world. The current level of consumption per person there is put at 57.4 g, and in 1990 it is expected to be 65.6 g. The latest recommended dietary allowance (1ThA) for a 70-kg adult male in the United States, however, is only 54 g. At 96.4 g, therefore, the current level of protein consumption in the developed countries appears to be far above minimum nutritional requirements. Summing all the trends, Dr. Nesheim said the developed world's composite demand for food is expected to rise at a rate of 1.5 percent a year over the next 10 years. Meanwhile its production will increase annually at 2.8 percent, adding to the comfortable margin the developed countries already enjoy. In the developing world, however, demand is expected to rise at 3.6 percent per year while food production's rate of growth will be only 2.6 percent. These are the kinds of data, he said, "that led to all the fuss in Rome and led, perhaps, to this meeting." On a worldwide basis, he said, these trends yield an approximate balance between production and consumption of grain by 1985. For the developing market economies, however, there is a deficit of about 85 million metric tons. Other studies have reached similar conclusions. A transfer of resources on this scale from the developed to the developing world is unlikely to occur solely from altruistic motives, he suggested. Dr. Nesheim raised several questions about these projections, especially those for demand. Will the world's economic growth, he asked, actually support the projected increase in demand for food, especially meat? Will it be economic to produce the extra cereals that will be required to feed many more animals? Will fertilizer and other inputs be available at low enough prices? Will the developing world's grain deficit actually permit it (aside from special cases like the oil-exporting nations) to feed more animals for meat? Will the Western world's food consumption patterns remain the same in the face of such movements as vegetarianism? at two points in the past, in 1939 and in 1972. The figures show a "very striking increase" in the consumption of meat, poultry, and fish--"stimulated," he said, "by the readily available cereals that could be converted into meat at very inex-,, pensive cost." Eggs and dairy products, however, have decreased somewhat, and direct consumption of grains has declined a good deal more. "As we change to meat," he explained, "we eat less bread and potatoes." consumption. Dairy prod-ucts account for 22 percent more and eggs for another 6 percent, so that 70 percent of the available protein comes from animal products. This total is considerably higher than in 1939. While consumption of fats has not changed much over these 33 years, vegetable fat has risen sharply at the expense of animal fat. Sugar consumption has also changed little, contrary to popular opinion, but the bulk of consumption has shifted from the home to manufactured products like soft drinks. "We've changed our habits, but we haven't changed our total consumption of many things as much as one might expect," Dr. Nesheim said. "Nutritionally, from 1939 to 1972, the energy availability has not changed a great deal," he said. "We have somewhat more protein, though not as much as you might expect on the basis of the large increase in meat consumption. We eat fewer carbohydrates. Our calcium consumption is about the same. Our iron consumption is up a bit. We have about the same Vitamin A intake. In all these cases, with the exception perhaps of iron for females, our nutrient intake is equal to or well above the 1974 RDAs." In light of the FAO projections, Dr. Nesheim concluded, the feeding of grain to livestock in the U.S. will probably become a political matter. "Will the United States," he asked, "have a grain policy as part of a foreign policy that will continue to allow grain availability to feed cattle, swine, and poultry at economical prices that will allow high levels of consumption to occur?" The "public health considerations" connected with animal products as well as the world food situation may well tend to reduce meat consumption as well as grain feeding in the long term, he suggested. one could also say that the true problem was one of a different sort--a population problem, perhaps, or, beyond that, a problem of purchasing power and distribution, since worldwide the projected demand and supply of cereals seem to be in balance. His conclusion was that there is no single overriding problem, that all these problems are important. On the FAO projections, Dr. Abel asserted that they assumed the price relationships among different classes of foods would remain constant. But this is not necessarily so, he said, citing powerful effects of changes in relative prices in the United States in the past two years. "What actually happens in 1985 will depend in part on what happens to relative prices of different kinds of food," he said. agricultural and industrial products. "It doesn't make sense, to me at least, for every country in the world to try to be self-sufficient in food," he said. Yet discussions tend to assume that countries are autarkic, with obvious exceptions like Singapore and.Japan. Trade cannot play its potential role in the redistribution of food, however, while countries like India lack the purchasing power to buy food and agricultural inputs. Developing countries therefore must wrestle with basic questions of rate of total development, both industrial and agricultural, as they affect purchasing power. Some countries with food problems but with some potential for agricultural development emphasize industry. Still others follow policies that distort the prices of agricultural products. Certain South American countries, for instance, keep the price of beef artificially low relative to cereals. Another example is rice, the price of which certain Asian countries are keeping well below world levels. Such distortions, Dr. Abel maintained, make it unprofitable for producers to adopt new technology and so discourage agricultural research. Dr. Abel said that if sentiment should grow for policies to reduce meat consumption in the U.S., he knew of only two measures that would be effective: a tax to raise prices and thus reduce demand--as has been done for petroleum--and rationing of supply. He hastened to add that he was not proposing these steps. But he did not believe that voluntary action would bring about much reduction, and as Dr. Pine had said earlier, sooner or later one has to stop talking about what should be done and begin talking about what can be done. He concluded with a call for research that will contribute toward a broad technological advance in agriculture, crops as well as livestock. He sensed a consensus at the conference that not nearly enough money was going into either the food or nonfood dimensions of livestock. During another period of general discussion Dr. Pino asked whether it is always true that people tend to shift from cereals into animal products as their purchasing power rises. Dr. Abel answered that this effect is supported by "overwhelming evidence from around the world," although such shifts would be consistent with prevailing preferences and cultural patterns. Nomadic herdsmen might represent an exception, but this would be relatively minor. Despite the changes in consumption of different products in the United States in this century,. he pointed out, the index of total food consumption per capita as measured by the farm-level resources used to produce this food had remained remarkably stable. Dr. Nesheim remarked that certain foods do tend to change together; if rice consumption changes, so will that of foods that go with rice. Dr. Schertz also cited evidence that in parts of the world, as very poor people gain in income, their consumption of cereals increases as well as that of meat. More income sometimes affects diets negatively, he added, as when people shift to more highly milled cereals or when mothers give up breast feeding. But in these matters urbanization is also a factor. On another issue raised by Dr. Abel, Colin McClung said the depressing effect of low-price policies on agricultural production showed up clearly in India in the 1960s. Only after shortages developed did the policy change, and when prices rose production did also because better technology was available. availability of free or subsidized exports is beneficial to these deficient countries, except in time of actual starvation. As long as you give them an option to keep enough resources to keep the price down, you do not stimulate production of grain or anything else within the country." Discussions of purchasing power, he said, also missed the point that at least half the people of Asia produced their ow~n food and were outside the cash economy. Ralph W. Cummings, Jr., replied with an argument that the food problem really was a distribution problem. When rich people create a demand for meat, he said, they make it more profitable to feed grain to animals than to sell it to humans. Doing so makes it less available to poor people and thus reduces direct consumption. In a sense, he continued, the United States does have grain, now being fed to animals, that could be released for human consumption abroad. But lack of purchasing power limits this course. Thus grain is available for use here in ways that some people would consider wasteful. Dr. Abel conceded that "we're always caught up in the short rum regardless of how much we want to think about the long run. But when we talk about problems we have to ask: Whose problems are they?" Argentina, for instance, because of "inimical" policies, has declined from a developed to a less-developed stage. Is this a problem for the United States, the world community, or whom? Whose problem is Burma, he asked, whose policies have brought it to the point where it may soon have to begin importing rice? Ultimately, he asserted, the responsibility must be narrowed to the individual country itself, though he excepted countries with the great humanitarian needs of a Bangladesh. Dr. Wheeler suggested that it didn't make economic sense for the United States to support a beef research program that might shift the comparative advantage of trade elsewhere unless a welfare criterion was defined. But Dr. Abel answered: "We do sometimes do the sensible thing even though we don't have a well-defined welfare function. We did get rid of our sugar program." Dr?. Nesheim concluded this discussion by supporting a point of Dr. Cummings' and emphasizing how alarming the projected food deficits were in some areas beyond 1985. He suggested that a transfer of resources from the surplus areas would be the only way to meet the problem. The United States, he added, had transferred resources to other areas in many ways in the past, including billions of dollars to Southeast Asia over the past 10 years. J. T. Reid compared the performance of animals in converting feedstuffs to human foods on the basis of material gathered with the help of his Cornell colleagues K. L. Turk and R. Anrique. Care is needed in examining this subject, Dr. Reid began, because there are many different expressions of efficiency. For instance, even within species, the most efficient synthesizer of protein is the least efficient synthesizer of fat, and vice versa; but both protein and fat are human foodstuffs. Efficiency, moreover, is a ratio, and this presentation uses energy as its major denominator. Differences among animals, especially in digestive systems, also complicate a comparison of their efficiency, he said. In the simple-gutted animal--the pig, the chicken, and others, in which, like man, digestion involves little fermentation--digestion chiefly is in the stomach and absorption chiefly in the small intestine. Ruminants such as cattle and sheep, on the other hand, employ a digestion brought about by bacteria in the front of the gut, although some digestion also takes place at the rear of the gut. A third class of animal is the nonruminant herbivores such as the horse and the rabbit, some of which also use fermentation. These differences, Dr. Reid said, result in differences in the animals, usual diets. The differences also affect the rate at which feed is digested and the nature of the substances absorbed. Starch ingested by the simple-gutted animal is absorbed as glucose, while the ruminant breaks it down into volatile fatty acids at some cost in energetic efficiency. Thus, on the face of it, a simple-gutted animal like a pig is one-third more efficient in energy conversion than a ruminant like a cow. the zero value on the vertical axis represents the maintenance requirement, or the level of energy intake at which the animal neither gains nor loses energy. - The chicken has much greater net utilization on a diet containing 32 percent fat (corn oil) compared with one at 4 percent. - A young calf has a very high (84.6 percent) net utilization on a whole milk diet. - Rabbits and guinea pigs, which are nonruminant herbivores, have somewhat lower net utilization than simple-gutted animals. - For sheep (and thus presumably for other ruminants as well) the particle size of the diet affects both net utilization and maintenance requirement. - In a comparison of steers and sheep on the same diet (66 percent hay, 34 percent oats), the net utilization was about the same but the sheep had a lower maintenance requirement. - For ruminants as a group, the general level of net utilization is below that of both nonruminant herbivores and simple-gutted animals. A diet containing concentrates, however, results in higher net utilization of metabolizable calories than an all-forage diet. general achieve the most efficient levels of protein production, growing more efficient as the proportion of grain rises. Broiler production under conditions common in the United States produced 11.9 g of protein per Noal, and egg enterprises, at an output of 200 eggs per hen per year, yielded 10.1 g. The level of pork production under ordinary conditions was 6.1 g per Noal. Beef production, under even the most favorable assumptions, trailed badly. This poor showing, explained Dr. Reid, resulted from the low reproductive rate, long growth period, and slow rate of turnover of cattle. "Nevertheless," Dr. Reid said, "there are some good things to be said for the beef animal." The future of ruminants, including beef cattle, is assured because they can digest the cellulose in grass and other forages, which mancannot use directly. Since so much of the world's agricultural land is considered fit only for grazing, cattle permit utilization of an extensive resource that man cannot otherwise make use of. The pig, he continued, is in the most precarious position of all farm animals in the United States from the standpoint of efficiency. This is because pork is relatively low in protein; at slaughter weight a pig will provide only 13.5 percent protein. But a pig enterprise requires a high subsidy of fossil energy, and it requires either feeds that humans can also consume directly or land for feed production that can also produce human food. forms of protein production, this approach showed that extensive systems were much less costly in fossil fuels and that within intensive systems milk required much less fuel than meat and was comparable to corn. Dr. Reid concluded by pointing out that the reason ruminants gain more slowly on forages than on grains is that their energy intake per unit of time is lower and their maintenance requirement higher. Therefore he called for research on ways to encourage ruminants on forage to eat more and to direct their metabolism toward the synthesis of protein rather than fat. He also suggested that the beef industry either turn to the later maturing types such as the Holstein or slaughter the traditional beef breeds at lighter weights. In a later discussion, Dr. Reid warned that it was dangerous to judge an animalls fatness by its appearance. He cited a study at the University of Illinois in which swine o f the same ancestry were bred for three different body types. In the end, the so-called rangy type seemed to yield more protein, even after it was slaughtered and its carcass physically divided into fat, bone, and lean. Yet when these pigs were analyzed chemically, there was essentially no difference among them in protein or fat. "It makes you wonder whether wetve really accomplished much in producing what's called the meat-type pig in this country," he declared. The potential of crop residues for animal feeds was assessed by Terry Klopfenstein. The potential is considerable, he said, for if we assume that there is one pound of collectible crop residue per pound of grain produced, there are about 1.25 billion tons available worldwide. This amount would support some 300 million cattle at the rate of four tons per animal per year if some supplementation was also available. At present, Dr. Klopfenstein said, residues are used as a growing ration for dairy and beef cattle (in the form of corn silage, a mixture of grain and residues) and as a winter ration for brood beef cows. These uses represent less than 15 percent of the feed requirements of the beef animal's life cycle. The cheapest method of utilizing such residues as corn and sorghum stalks is to let the animals graze in the fields after harvest, but bad weather may limit such grazing. Then too, cattle eat only 30 percent of the residue that could be gathered by harvesting. Harvesting adds considerably to the cost, however, and thus is not economic unless calf prices are high. is $2 or more per bushel. In some ways calcium hydroxide is a more desirable chemical for treating residues, he said, and it has been -used successfully in a mixture with sodium hydroxide. Related work is in progress in other countries; in Europe a process has been developed for pelleting straw and sodium hydroxide, which gives a dry product that can be shipped. Shippers have already begun moving it to Japan from the U.S. West Coast. A treatment of corncobs with steam at 200 pounds per square inch has also given excellent results, but the rising cost of fuel has reduced its attractiveness. some potential for this purpose. Materials that he and others listed included such by-products of the food-processing industry as bagasse, rice straw, corn gluten meal, molasses, distillers' and brewerst feeds, and fruit and vegetable waste; industrial by-products such as sulfite liquor and pulp fines from the woodpulp and lumber industries; meat meal, paunch contents, and blood from the livestock industry; and even animal manures. The use of crop residues as fuel has also attracted interest, he added. General Motors and Iowa State, he said, had been investigating the possibility of deriving all of a factory's energy needs from the crop residues available within a radius of 25 miles or so. The potential of manures was described in greater detail by W. L. Johnson. Tests are under way, he said, to develop methods for making use of the manure produced by dairy herds. When processed through a vibrating-screen separator, the liquid portion of the manure that passes through still retains most of its value as fertilizer. The rest, called screened manure solids (SMS), is a virtually odorless product. It has been shown to be useful.-as bedding for cows; as a feed it also appears to have some value as a fiber source in complete feeds or as a roughage extender in other situations, but not as a source of crude protein, as have whole cow manure and poultry litter. Dr. Johnson said that his research at North Carolina State University began with a test of the palatability of rations containing SMS. He found the intake to be satisfactory as long as the rations were mixed daily with fresh SHS; palatability declined sharply after standing for 24 hours, especially in warm weather. levels of SXS in a ration could severely limit the voluntary intake because the animal's gut would fill with fiber that would digest relatively slowly. better appreciated if one considers that using conservative assumptions, manure from a 150-cow dairy herd will yield about 1,500 kg of SMS per day. . This amount of SMS could provide the entire roughage requirement of all yearling heifers being raised for herd replacement, with enough left over to feed out an equal number of steers for meat purposes." Initial tests of making pressed-particle boards of SMS for the construction industry were also encouraging, he added. James McGinnis opened his discussion of the potential of' nonrwninants with a defense of animal products in general. While plant scientists may in time develop vegetable sources of essential amino acids, they have not yet done so adequately. Until they do, animal products are necessary for nutritionally adequate diets. "The most efficient thing we could do would be to formulate diets for humans as we do for animals. I don't understand why, since we've begun making hamburger patties from soybean protein, we don't go the next step and produce a more complete food. This would let us begin using components like synthetic amino acids that we don't begin to feed people now." The nonruininants to which the conference had so far given the most attention, he said, were swine and poultry. But among those that deserved more attention in the future are the two single-stomach herbivores that were mentioned by Dr. Reid, the rabbit and the guinea pig.. From the standpoint of efficiency of energy utilization, Dr. McGinnis continued, fish have the greatest potential. This is because they can consume water plants that require only sunlight and fertilizer; fish can be fed like other animals. Discussions of efficiency in animal production often overlook the possible uses of animal wastes, he said. "If we conserve the nitrogen in the wastes, it's amazing how little we really lose," he explained. He described a visit he once paid to a large egg facility in Chile which, because of disease and other problems, was not doing very well. But when he expressed his concern, he was told: "Don't worry. We're breaking even on the eggs and making a profit selling manure to the vineyards. That's why we're in the poultry business." Plant improvements, Dr. McGinnis noted, have potential in animal feeding as well as for human food. The opaque-2 corn, for example, produces an added growth in swine that cannot be explained solely from the extra lysine content. The greatest potential for both animal and human use lies with the leaf proteins like alfalfa, which can produce 3,000 or 4,000 pounds of protein per acre in .a year but which now lack essential growth-inhibiting substances such as saponin. Scientists should also be alert to improve products like manioc, which he said offers the "greatest productive potential of a highly digestible carbohydrate of any plant in the world." Many areas of the world that have difficulty growing other crops could grow great quantities of manioc but now are producing none. He suggested that fermentation, which has been used to convert nonprotein nitrogen in cereal grains into single-cell protein for swine feed, could be used to up grade the nutritional value of manioc. The conference participants' subsequent discussion centered on cyclical systems in which animal wastes are used as inputs in the production of animal feeds. Examples mentioned included the traditional Chinese system of pig production, which is associated with fish in ponds; a similar system in which silkworm droppings fertilize a fish pond; and a sugar enterprise in Taiwan that feeds refinery by-products to pigs and uses the manure in the cane fields. Dr. Turk added that economically it makes a difference whether one is considering Taiwan or New York State, since the labor costs of handling manure are different in each place. Any examination of agricultural potential, Dr. Raun suggested, must recognize the limits of the available resources. The availability and prices of grains and roughages affect ruminant production in the less-developed countries just as they do in the United States. Another economic factor, consumer demand, is not as sophisticated and specific in Latin American countries, for example, as in the U.S.; "it's just pretty much for meat" rather than for different grades and cuts, he said. production, according to Dr. Raun. Many of the South American grasslands with which he is familiar are unfit for cultivation because of poor rainfall or soil, and grazing is their most suitable use. Others may be cultivable but lack the roads and markets necessary for commercial crops; on these, livestock can represent an opening stage of development, as they did in parts of the American West. rate of 12 percent and an average slaughter weight of 350 kg). The total production for all Latin America, for comparison, was 7 million tons in 1972. If all of these poor-soil areas were planted in improved grasses (which, by and large, are native species that have evolved over wide areas under present systems of management, including periodic burning), average production would rise to 16 kg per ha and the total to 4.8 million tons. At the outer limit of productivity--assuming establishment of a combination of tropical forage legumes and grasses, which would require the addition of phosphorus to the soil--production might double that. But these projections represent theoretical potential, not what anyone actually expects. Dr. Raun next examined the potential for using crop residues as animal feeds in integrated crop-livestock systems in Latin America. He cited four research projects that involved feeding various mixtures to native mixed-breed cattle. All showed promise, especially one which, he said, was simple but highly acceptable to animals. This mixture produced a very high gain, although the efficiency of conversion was not high. It included safflower meal (which is high in protein but also in fiber), molasses, and cottonseed hulls. An example of an integrated system tested at CIAT, Dr. Raun said, involved intensive grazing on pangola grass to which 500 kg of nitrogen was added per year. This system produced an annual liveweight gain of 1,358 kg per ha. A colonization project involving 120 farms of 20 ha each in Guatemala is using a similar system. Each farm supports 40 to 45 cows representing 70 to 75 animal units. The project has apparently been quite successful; the farmers show no inclination to convert to crop production. Dr. Raun said, could have been sugar cane) was grown with an application of nitrogen and with irrigation as necessary, and was fed freshly chopped. This system produced a carrying capacity of 12 to 15 animal units per ha and an annual liveweight gain of 2,400 kg per ha. A still more intensive (especially labor-intensive) system involved feeding of dairy cattle on a small farm. The milk was sold commercially, and surplus heifers and male calves were sold for beef. may therefore become more widely adopted in time, assuming that cost-price relationships are favorable. of whatever resources are available. In describing the alternative uses of land and other resources in the humid and semihumid tropics, Dr. Spain provided more detail on the soil types of South Amerioa and their geological origin. The continent's major land forms, he said, are the Guyana shield in the north, the Brazilian shield to the east, and the Andean region. The shields are covered by very deeply weathered soils formed in place. Between them and the Andes is the enormous sub-Andean depression, which is filled.--in places to a depth of 40,000 feet--by poor sediments washed down from the mountains. Much of the depression, moreover, is badly drained. The soils of the entire tropical region are highly acid and infertile, with a cation exchange complex dominated by exchangeable aluminum. The few exceptions, which because of their rarity are quite important, occur along major drainage ways, where erosion has rejuvenated the soil, and on outcroppings of basalt, which have given rise to fertile soils with high base saturation. mm a year. In some areas it exceeds 10 m, or around 400 in. In the wetter regions there may be no pronounced dry season, but in drier regions there is usually a period of extreme drought of up to six months. Three types of tropical vegetation are dominant: wet evergreen forest, seasonal forest, and savannah. crops, grazing of seeded, perennial pastures, subsistence food crops, and commercial production of annual crops. The first alternative, however, is not plausible, he said, because it would be impossible to prevent "a wave of people from moving into these areas and using or misusing them." The difficulty in providing necessary inputs ruled out commercial production of annual crops except in places near markets and sources of lime and fertilizer (especially phosphorus). Here, however, capital investment can create highly productive soils, as has occurred in the Campinas-Sao Paulo area. production. Since the plants they now bear are mostly of low palatability and nutritive value, however, their productivity is low under present management systems. Replacing these plants with better forage species found elsewhere in the region or on other similar ecosystems can create dramatic improvements in production, but despite its apparent simplicity this step does require greater capitalization and management and a higher level of technology. Some of these savannahs have soil, topography, and other factors that in the future could conceivably be used to grow annual crops, Dr. Spain asserted. 'Until then, as Dr. Raun had pointed out, beef is a logical first step in their development. But other vast areas should never be used for annual crops. An example cited by Dr. Spain is found in the southern Colombian llanos, where a rolling, heavily dissected area of 8 or 9 million ha stands in sharp contrast to a smooth, well-drained plainer just to the north. Livestock production is the best available use for the dissected land. "The future of the humid tropics of Latin America," Dr. Spain concluded, "depends on many complex factors. The biological potential of the region is great; but the realization of this potential requires many inputs, including new technology, vast amounts of capital, and the training of management at all levels. The results could mean increased employment, better income distribution, and more food for the people in the region." - Range lands are a major class occupying about 40 percent of the world's land area. They include tundra and alpine regions, forests, intramontane valleys, plains, savannahs, brushy areas, coastal marshes, and deserts. - They are a basic economic resource of many countries. They represent 62 percent of the land area of Mexico (or some 120 million ha) and 54 percent (or 410 million ha) of the contiguous 48 states of the U.S. They occur in all parts of the world, including Africa, the Middle East, South America, Australia, and New Zealand. - They are suitable for grazing, or perhaps for forest products or mining, but not for cultivation because of such factors as climate, terrain, and soils. - Their productivity is low in many areas, but this is the result of mismanagement, specifically (1) overgrazing, which causes erosion; (2) plowing, which leads to tremendous soil losses and reduces productivity; and (3) failure to minimize the risk of adverse weather. - Their potential, nevertheless, is very great, provided they can be properly managed. stop overgrazing. The proper intensity of grazing must be determined for each area as well as the best grazing system--continual, rotational, or seasonal. Such practices as using molasses to increase the palatability of dry, coaxse grasses must also be examined. Dr. Gonzalez listed several other practices that improve range lands. Among those that conserve rainfall are the removal of less productive plant species such as mesquite and construction of water catchments. Reseeding and fertilization, especially with nitrogen and phosphorus, can also create dramatic improvements. He estimated that in a grazing area of northern Mexico, good range management practices could increase forage production by 100 percent in five to seven years and up to 300 percent in the long ran. Combined with improved animal husbandry, these practices could yield corresponding increases in beef production. And these results are possible not only for North America but for many other parts of the world. the holding, control of public or communal lands is a major problem. Dr. Pino agreed that security of ownership would create an interest in conservation of inputs, sustained production, and the like. On the size question, however, Dr. Raun and Dr. Spain noted that much of the productive capacity of the Venezuelan and Colombian llanos was unused, not because the units were too small but because they were too large. William McMillan, discussing the issues raised at the conference, said he had reached one major conclusion: "I really see no need for the U.S. consumers, and maybe other consumers of the world, to have to worry about sacrifice when it comes to proper nutrition." Protein and other nutrients are abundant in the United States, he explained. As far as he could see no basic change would. be necessary for the countryts agriculture to meet its future requirements both at home and in worldwide humanitarian aid. Mr. McMillan nevertheless thought that grain would never again be cheap enough in the U.S. both to grow out and to finish cattle. He attributed the overcapacity of large Western feedlots to the recently adopted practice of taking cattle in at heavier weights and feeding them for shorter periods. A major factor in the present difficulties of the beef industry, he said, is the reverberations from the 1972-73 ceilings on beef prices. He warned that the importance of livestock, from which almost half of the U.S. farm income is derived, means that serious repercussions would follow any changes that might be forced on it by political or other pressures. As for the world. food outlook, however, he said he was "very much encouraged." This was because of what he saw as its "obvious gearing" because of climatic conditions, soil types, and the like to the ruminant type of animal. He was concerned, however, by the huge capital investment that would be necessary to improve grazing lands and technology. He said: "The U.S. has been fortunate in the availability of. capital and management know-how. We have the capacity to employ the know-how elsewhere in the world--but not necessarily the capital." On the question of the U.S. contribution toward easing hunger in the rest of the world, Mr. McMillan called for more study. "Inevitably we think about the United States exporting cereal or vegetable type protein," he said. "But I believe we have to develop more meaningful information on per-unit costs of food, whether it be animal or vegetable protein. We should crank in the possibility of shipping, as part of our humanitarian commitments, animal protein which can be combined to give the proper amount of calories needed in a balanced diet." Dr. Abel, the final speaker of the conference, raised as his first issue the need for policies that will stabilize the supplies and prices of basic commodities. Many of the U.S. livestock industry's current problems, he said, stem from "the most rapid and dramatic change in grain prices in this century" over the past two years. If the changes had been gradual and more predictable they would have been absorbed more easily by the livestock industry. But if there is steady improvement in the worldwide standard of living, the demand for animal products will inevitably grow. This conclusion was based on evidence from many countries. "The same forces are at work in the United States that work in just about every other country," he said. But he added, that it is true that tastes and preferences for particular products--milk, for example--change over time and that changes in relative prices will also influence the levels of consumption of different commodities around the world. As for feeding the world's hungry people, Dr. Abel saw two issues. One was the role of livestock in the growth and development of a national economy. The other was inadequacy of personal income, which poses the problem for potential donor countries of how much to offer in the way of assistance. One feature of the conference that had impressed him, he said, was the evidence it had provided of the great variety of roles that livestock play in different economies and societies of the world. This realization provoked in him a sense of caution. "I don't think we know enough about how livestock is now produced and how it fits into the total farming operations in developing countries," he said. "I would suggest that there might be a great return to finding out more about this before we make any radical recommendation or invest huge sums in trying to bring about improvements." - Animal diseases. They not only limit production but prevent countries from benefiting from the growing importance of animal products in world trade. - Livestock production as part of systems that also include crops. "Many times you cannot bring about much improvement in efficiency of livestock production or in total output without also bringing about radical changes in the whole cropping System," he asserted. "But this involves very difficult issues of management skills, education, infrastructure, markets--the whole works." -"Unfavorable externalities" such as policies that lead to overexploitation of both range and crop lands. He cited the abuse of resources in hill areas of Pakistan, Tndia, Nepal, and other places. "Free and open use of these resources by man and all his animals won't do. But here again we get into the very difficult institutional and political problems." - Improving feed supplies. Because the conference had discussed this issue at great length, he said, he would say no more about it. - The implications for income distribution of alternative forms of increasing livestock production. Much of this production in Asia is performed by smallholders, but in many other areas the large producers are heavily dominant. He asked: "What are the possibilities for increasing production efficiently on the smaller farm? And what are the policies that would be required to support this kind of development if it makes sense?" - Regressive price and other agricultural policies at the national level and their effects on international trade. "The price of beef, for example, has been kept artificially low in Colombia, Argentina, and a number of other countries," he said. "And I suspect that because of this there is little incentive for private producers to adopt improved methods, although such investments might be socially profitable." and others, presents problems or opportunities in different countries. - Processing and marketing of livestock products. As an example of the imporportance of this aspect, Dr. Abel cited a cooperative dairy in the Indian state of Gujarat. There, an intelligent, energetic manager has organized thousands of producers, each with only one or two lactating buffalo, much to everyone's benefit. But such achievements are difficult to duplicate, and more knowledge of the subject is needed, especially as it affects small-scale producers of perishable products. - Markets, that is, the linkages between the producer and the ultimate consumner, both domestic aud international. - The substitution between animal aud vegetable sources of proteins. "I feel very uncomfortable about making any predictions in this area," he said. "I find that when we buy imitation meat products made with soybeans they're awfully expensive. Now is that an error in the technology? Is the market not big enough? - Economic features of consumption outside the industrial economies. "As economists, when we get beyond the United States and a few other countries, we really don't know the quantitative effects of price changes on substitution among foods, and we're not even so sure about what the income elasticities of demand are. This is a big, empty box on our shelf of knowledge that needs filling." Other participants in the conference now commented on points made by Dr.Abel or Mr. McMillan. The chairman, Dr. Pino, agreed with Dr. Abel's last point. "I feel we don't have enough thought being given today to the total implications of things," he said. "How d~o we manage everything? Who is to manage everything? And on what basis should that management take place?" Moreover, policy makers, he said, need the issues of livestock development laid out so they can at least know what problems they should be thinking about and what the implications of various policy choices are. consumption around the world, however, is not possible. The problem, he said, is to utilize available resources "where it makes the most sense economically, 'polltically, or whatever." On Mr. MoMillan's point about the tension between food production and environmental protection, Dr. Pino said: "Maybe we oan accomplish both. There may be some oost . some other adjustments involved. But I think we need to think about those." Two other participants addressed themes that they believed had received inadequate attention in the discussions. Dr. Mesheim, pointing to the title of the conference, commented: "I'm not sure we really came to grips with the future very well." The short-term projections for grain call for substantial exports by the United States on the basis of steadily rising production. Yet the inputs of fuels and other resources necessary to achieve this result are becoming more and more scarce. It may not be possible to draw a conclusion on this point now, but it is at least a gnawing worry. moral and political pressure over its grain policies and that the world's population and food problems would come to influence the domestic scene in unprecedented ways. He wondered whether the questions of relative efficiency of feed conversion discussed by Dr. Reid might not become matters of serious policy concern. Dr. Turk, for his part, asserted that the dairy cow was very important but had been passed over lightly. It is the most efficient animal--two or three times as efficient as the beef steer--in the utilization of both roughage and concentrates. In New York State it accounts for more than half the gross farm income, and its potential in other parts of the world is tremendous. In reply to a question by Dr. McGinnis, Dr. Reid explained that the dairy cow was so efficient because its product had no bones or other waste and because it would eat as much as four times its maintenance requirement. the general need for research and which areas required it. Dr. Byerly revived the subject with a summary of studies that showed the returns to investments in agricultural research were quite high. On this basis, he said, such research receives perhaps one-tenth of the investment it deserves. A recent survey found evidence, however, that these returns had begun to decline. "And I think it's time we did something about it," he concluded. Dr. Turk expressed the belief that animal research is supported much more poorly than crop research. Dr. Schertz noted that the subjects selected for research had "tremendous implications" for income distribution, which should influence decisions on how to increase research funds. "Who," asked Dr. Butcher, "is making decisions on the allocation of research in the world?" Dr. Abel replied that much of the research is sponsored by governments but that in the United States as much as half the total was undertaken by private industry with little in the way of published information on how much is being spent and on what kinds of research. In some countries the perverse economic policies he had discussed serve to discourage research as well as investment in certain areas. Internationally, the Consultative Group on International Agricultural Research has come to play a major role in allocating resources to the international research centers. Why the agricultural research sector should suffer from underinvestment is unclear, Dr. Abel continued. Possible factors are low national priorities for agriculture, bureaucratic inertia, the failure of economists to take all relevant factors into account in measuring the returns, and other measurement problems. other livestock, it is unclear how to assess what is important, where funds should be allocated." In summary, Dr. Pino admitted that the subject of the conference was big and unwieldy. "But we felt we had to begin to get some feel for what the shape of this elephant is," he explained. He thanked the participants for their help in tracing the subject's main features. . . .. . - - -. . . Source: FAO, Production Yearbook, vol. 26 (1972). c. In addition to this amount, milk production from goats and sheep in Latin America totals 379,000 tons. a. Source: FAO, Production Yearbook, vol. 26 (1972). fruits, root crops 1.1, 59.0, 50.0. Carcass grade Med. ch. Low ch. Source: Adapted from R. P. Oltjen et al., "All-Forage Diets For Finishing Beef Cattle," Journal of Animal Science 32 (1971): 327. Table 15 DISTRIBUTION OF GRAINS IN U.S. Source: Progressive Farmer, May 1973. "Zero" "Trend" "High" "Zero" "Trend" "High"